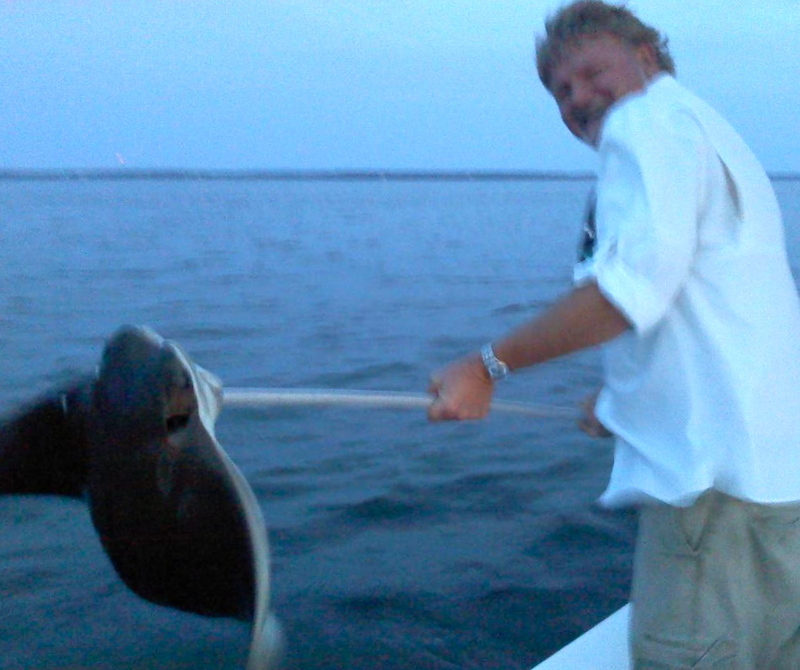 Before you can bring a Chesapeake ray home to the kitchen, you first have to get it in the boat. You will want to kill it and cut off the tail before you ever bring it over the rail. I don’t carry a gaff, but I do keep a heavy duty boat hook onboard Thunder Road. I slipped the hook through a gill slit on the underside of the flapping fish and lifted it to the edge of the boat. A wrap or two on the head with a heavy anchor and it stopped moving enough to snip off the tail with a pair of wire-cutters. I used a sharp fillet knife to cut the wings off both sides of the body. There was a lot of blood, so I quickly hosed off the deck with sea w ater. I then packed the wings on ice and headed for the dock. Once I got home, I took out one of the wings and placed it on a cutting board. It reminded me of a shark fin. There is a layer of cartilage through the center, so I filleted down to it and peeled back the meat. I then repeated the process on the bottom side of the wing and removed the skin. There is a lot of meat, but since this was an experiment, I didn’t feel the need to be too conservative in getting it all. I was left was two steaks of a couple pounds each. I’ve heard a lot of rumors about the quality of ray meat, so I want to point out that there is absolutely no bad smell to the meat. It isn’t oily or slimy. It is a little bloody. The meat is mottled pink and red and somewhat stringy. The overall consistency of my raw ray fillets was similar to that of a pork tenderloin. 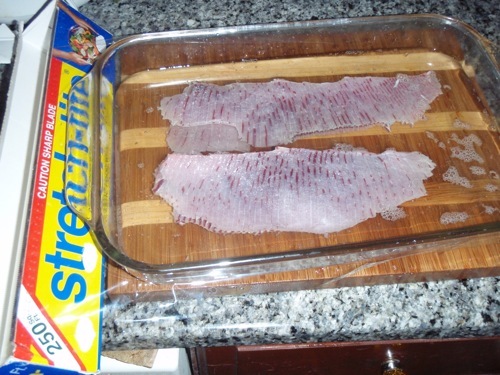 I put the fillets in a baking dish and covered them with a mixture of white wine, rice vinegar, salt, and water. I placed them in the refrigerator to marinate. The next night I took the ray meat out of the fridge and put it back on my cutting board. The meat was a lot whiter now, but still mottled with red and brown streaks. My plan had been to cook it on the grill, but I changed my mind after seeing the meat. There was still no smell except for the wine and vinegar, but frankly, it didn’t look very attractive. Since I figure you can bread and pan fry an old army boot and make it taste good, I decided to go that route. I cut the fillets into strips (stingers) that were about four-inches long and an inch wide. I breaded it by dipping it in flour, then a scrambled egg wash, then a final dip into Martha White Self-Rising Corn Meal Mix. (Yes, they’re still making it, and yes, I still love those Flatt & Scruggs bluegrass tunes they use in their commercials <—- click here.) I added Old Bay, salt, pepper, snipped chives, and a pinch of sugar to the corn meal mix. Each strip went into hot vegetable oil. I didn’t leave it in very long, just enough for the batter to turn a crispy brown. I removed the strips and put them on a paper towel to dry. I served my “ray stingers” with roasted new potatoes and steamed green beans. I also included a dipping sauce I made from sweet red chili sauce, soy sauce, and homemade raspberry preserves. They looked pretty good on the plate. I’m happy to say my wife was fairly open-minded about the experience, so we sat down to try them together. Okay, so here’s where I would just love to say my ray stingers were the most delicious thing I ever put in my mouth. They weren’t. But, they weren’t bad either. 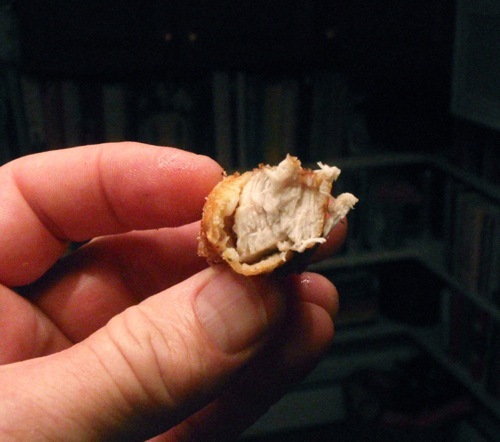 Really, they weren’t anything, just a very mild-tasting fried meat. The strips were moist and juicy inside with an odd consistency. It wasn’t really chewy, and it wasn’t tough, but it was firm. I guess the closest thing I can compare the texture to is veal. My wife and I both ate all the strips on our plates. We didn’t go back for seconds, but I munched down part of another strip later that night just to give it a second shot. My honest opinion is, not bad, not great, but certainly edible and something I might try again. 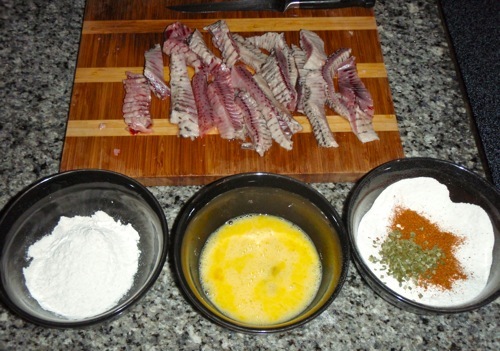 It is certainly not something I would want to eat as frequently as we eat rockfish but I might give it a go if I saw it on a restaurant menu to see how someone else might prepare it. Since nutritionists say the meat is very low in fat and high in protein, I can see how someone might want to include it in their regular diet. Since the taste is so bland, I won’t hesitate to try it broiled or on the grill next time. I think it might also be good in bite-size chunks with buffalo sauce. I think the jury is still out on the sustainability of cownose rays. If they really catch on as a food source I expect they will have to be managed just like any other species. There is some thought that they could be over-fished quickly due to their long lifespans. For now, it looks like there are plenty. Stay tuned, because I still have part three in the breakers series to post. The next segment will be about getting bigger fish out of the rockfish blitzes. Until then I’ll leave you with a video of gracefully schooling cownnose rays near Sharps Island. 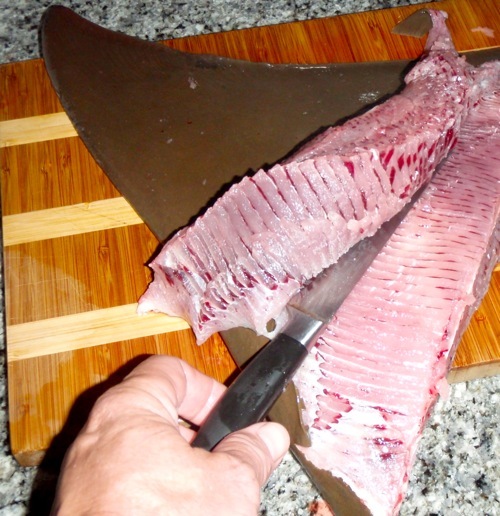 If you decide to catch and cook one for yourself, please let me know how it turns out! 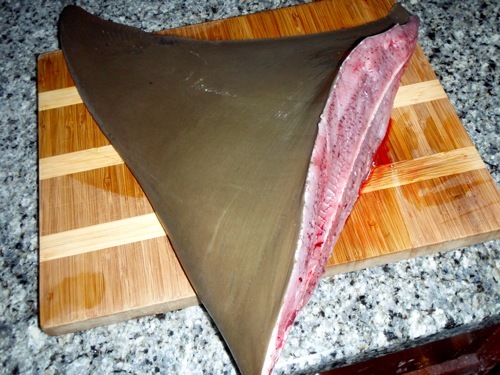 Cool experiment, cooking a ray has been on my list for sometime. The next ray I get boat side will be Ray Nuggets. I always heard they were terrible so I appreciate your article and the detailed instructions. I might try one someday, maybe. I’m looking forward to the third series about breakers. I went to Poplar Island tonight. There was a lot of people fishing, but only one barely keeper. I thought I saw you buzz by us and I told my buddy we should followed you. P.S. We were fishing under bird with several other boats but you didn’t even stop. How did you know they were little fish? 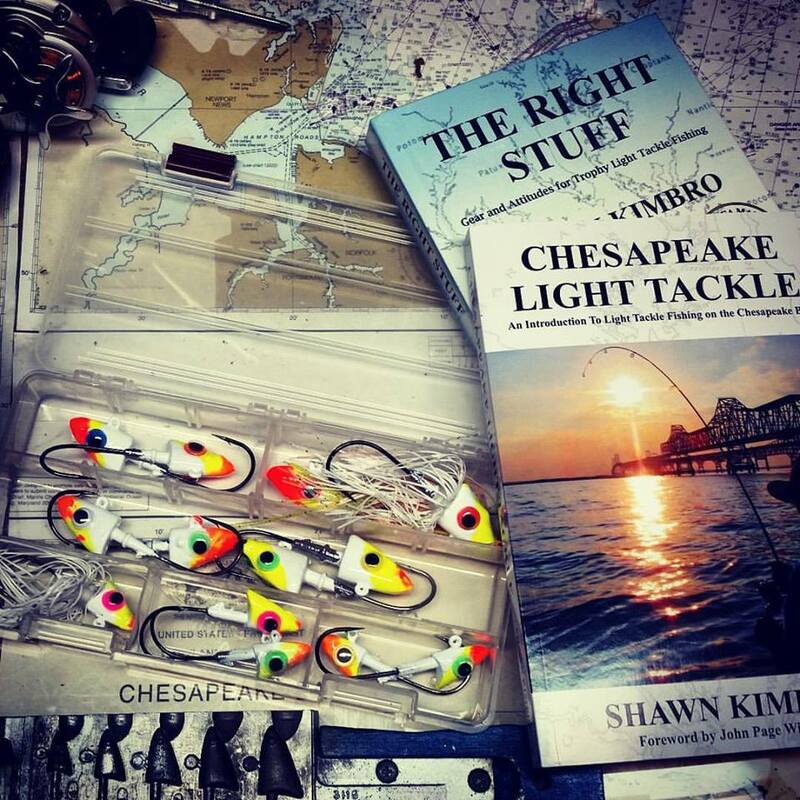 Were you fishing with the fleet off Poplar Island? If so, I didn’t stop because you guys were in shallow water, 8′ or so, and it looked like mostly terns diving. Plus, I hate fishing around a bunch of other boats. Someone posted pictures of Poplar Island on one of the fishing boards this week, so the crowds have arrived in force. I think we had 14 fish that would have been keepers tonight, most caught on big topwater plugs and, believe it or not, we had them mostly to ourselves. as a chef for over 20 years and an adventurous foodie, I have tried ray several ways, including grilling, seviche, poaching, pan searing, roasting you name it, all the same conclusion, they arent that great, many people assume they will be the same as ther cousins the skate,which are delicious, but not even close. On a another note boat is in the shop and I haven’t fished in 2 weeks. Looking forward to you rnext post. Thanks Shawn. So dave, Clear nose skates commonly found in the atlantic shallow waters are delicious? Would you prepare them the same way? Do they have that cartilidge dividing the wing like a cow nose? I know their wings are usually much thinner, maybe that’s why they are better? I hit a wrong button. …. One would think that cow nose rays would make great crab pot baits. An exotic grocery store here in Germantown sells cow nose wings but call them skates. Too often people confuse the two. I gave broiled skate wing a try once. I was at a restaurant in Fells Point. I figured if I was ever going to try it, I should have a real chef do the cooking. Just like your cownose wing, it was not that good, but not that bad. Thanks for saving me the trouble! I owe you. A classic restaurant recipe is lightly dusted in flour, salt and papper, saute over meduim heat in butter, only a couple minutes per side, like scallops they get tough when over cooked, finish with white wine , parsley and capers. I do think the thickness is the difference, the wing just doesn’t seem as dense in testure. Since I always bought the wing from a wholsaler they were smaller in size than the cownose we see. tried years ago to make small sharks from the Del. Bay more palatible.Pretty much came to the same conclusion-ok,didn’t have much taste of their own. A lot of creativity to make them enjoyable.Of course back them we had plenty of weakies so taking a shark home wasn’t on the top of the list. I just knew you wouldn’t leave the part out about all the blood that comes out of those dang things,Shawn. Tried them on two different occasions,I just couldn’t get passed the consistency of the meat. Now, I just look at them as a good tackle testers.If you have a weakness somewhere in your knot or equipment they will definitely find it. I tried them ten years ago after going bow fishing with a long time friend. I took home just one wings worth and found the same. They were okay but not worth the work and risk to fuss with. No thank you, but I like the video. Beat ingredients together and taste. Should hit all 4 taste senses (salty, bitter, spicy, sweet). Add more ove above ingredients to liking. Rub the wings (or rockfish fillets for that matter) with a light coating of Evoo or peanut oil so they dont stick to grill. Dont add too much oil or flare ups will occur and burn the meat. Grill over med heat, about 3-4 minutes on each side, or until the meat begins to flake on the ends. Liberally brush the above mixture on the fillets before flipping sides. The honey should start to cameralize a bit and help the mixture stick to the meat. 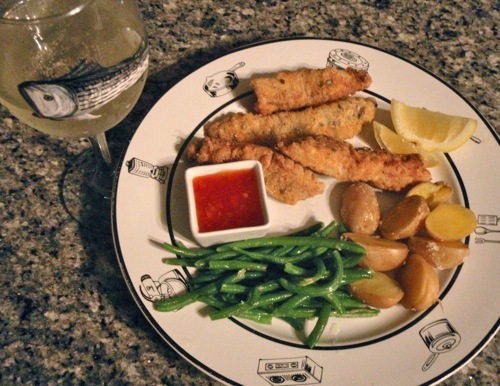 Serve with gingered jasmine rice and sauted green beans or snap peas and you have a bastardized version of Thai rockfish or ray wing. You can also add chopped ginger to the grilling sauce but some folks dont love the bite of ginger. You could also drizzle cocunut milk over the fish/rice for an added dimension of sweet. Family favorite in our household! Had skate at fish and chips place in Colchester England. Very tasty!! I hear southern stingray is much better than CNR eating wise and alot worse stinger too! Most people love cownose rays because they are beautiful animals. It is sick to kill them.